Published in the South Kent Gazette, 25 February, 1981. A stonemason’s yard at the bottom of Frith Road, which also stood on this site, came after the widening of Salisbury Road. Another property which stood on the Green was the Sportsman Inn, a pleasant old-fashioned retreat in a garden, with a life-size effigy of a sportsman standing in a pretty forecourt. The Sportsman was subsequently rebuilt, adjoining Palmerston Terrace, but has now disappeared. Palmerston Terrace was built in 1868 by Mr J. N. Tunbridge. Part of the old Green is now included in the churchyard of SS Peter and Paul. When this piece of land up to Frith Road, was added to church lands in the middle of the 19th century a wall 81 feet long was built around it and had the date 1850 inscribed upon it. As part of a street widening scheme of 1893-94 the road was made wider at the Peter Street end and the Charlton Green post office and Grapes Inn were rebuilt, while another public house, the Rose Inn and other properties, were demolished. This made a great improvement to the approach to Charlton Green which is now only regarded as the northern extremity of Maison Dieu Road. Crafford Street and Dour Street form a link between Charlton Green and the Maison Dieu. Crafford Street is the name of the short road which connects the upper part of Dour Street with Maison Dieu Road. It was called Crafford Street after John Crafford, who was Master of the Maison Dieu in the reign of Henry VII Crafford Street was laid out at the same time as Dour Street, and taken over as a public street in 1868. A long time before that date the site of Crafford Street was a nursery garden, occupied by Mr Stephen Johnson, who, in 1828, relinquished it. After lying dormant as garden ground nearly thirty years, about the yea? 1860 Mr Thomas Chaney, a Dover carpenter, speculated in it. He was the first to build on this part of Maison Dieu Road when it was Charlton Back Lane. In 1860 he built eight houses on the east side, leaving the opening for Albert Road in the middle of the row, which was called Albert Terrace; and he also built five on the opposite side, from Alma Place to Crafford Street, and the first pair of semi-detached houses called Cheltenham Villas, leaving between them the Crafford Street opening. The twelve tenements in Crafford Street were the work of other builders, the 15 houses near its entrance being all that Mr Thomas Chaney lived to finish. Dour Street was laid out in the year 1859. It was so named owing to its running parallel with the River Dour, which is on its west side. It was proposed to call it Gore Street, after the Gorleys, who for many years lived at Ladywell Farm, and occupied the land, but by the direction of the Town Council, the name Dour Street was adopted. The land on which it is built is a part of the Maison Dieu Estate, the ground landlord of which is the Sovereign. Messrs Nightingarl and Bushell on the 10th of March, 1859, commenced laying the foundations of the first four houses without sending any plans to the Borough Surveyor. On the same date plans for four more houses were sent in by Mr J. N. Tunbridge. It was a very informal beginning, the road was not properly laid out, there was no sewer, nor the water laid on. Owing to this condition of things progress was so slow that in July, 1862, only twelve houses had been finished, and but three occupied; but in the course of a year from that date Dour Street was margined on both sides with 37 convenient houses, several being bought through the agency of building societies. The land between Dour Street and the Dour, which appeared, from the two openings left, to have been intended for a row of riverside cottages, was for several years used as the building yard of Mr Alfred Matthews, where his extensive workshops were destroyed by fire on the 10th of April, 1874. The land was subsequently incorporated in Messrs William Crundall and Co’s Wood Street timber yard over the river, to which it was linked by bridges. The high green mound, long known as Chapel Mount and the site of the chapel of Bartholomew’s Hospital, is surrounded by Tower Hamlets on the south, by London Road to the east, Buckland Bottom to the north and on the west by Whinless Down and Coombe. Tower Hamlets, lying in a broad, deep vale, bounded on the south by Priory Hill, and on the north by Chapel Mount, forms a peninsula-shaped, densely populated locality, which the isthmus of Tower Hamlets Road unites to the mainland of Charlton. If we could look back 170 years, we should see the valley destitute of human habitations, except, perhaps, a shepherd's or herdsman’s hut, under the northern ridge, where Noah’s Ark Dairy used to be located. One hundred and thirty years ago there were but a few brickmakers’ cottages here, among which there was the unusual proportion of four beerhouses; and the only other traders appeared to have been one shopkeeper and one baker. In those far-off times the locality had no name, except its ancient designation of Charlton Bottom, and its only distinguishing feature was a tower, still standing on the side of Priory Hill but heavily disguised by its residential conversion of the 1970s, which was built to supply water. For many years brickmaking was the staple industry, and when the output of the brick fields began to be used up in building houses, the question of a name was discussed by Messrs. Finnis and Son, When the son—Mr. Steriker Finnis — jocularly suggested, “Let us call the place Tower Hamlets,“ and that name was adopted. In making our survey, it will be most convenient to begin with the approach up Tower Hamlets Road, which dates from the introduction of the London, Chatham and Dover Railway, in 1861. The old road, which was called Black Horse Lane, from the Black Horse Inn that stood at its entrance, was on a lower level, and ran in a straight line from High Street, past the scavenging depot, over the railway and entering Tower Hamlets just by the arched entrance to what used to be Mr. Goodwin's bakery in East Street. It was intended, by the railway engineers, that this road should have been left and the line traversed by a level crossing; but the Board of Trade would not allow that crossing so near to the entrance of two tunnels. A bridge at that point would have necessitated a stiff gradient of 1 in 7, but by giving the road a curve southward the rise was reduced to 1 in 13. Beside the old road was Smith’s lucifer match manufactory, burnt down on the 28th of November, 1849. The buildings on this road, between High Street and the bridge, are all of later date than 1861, including the former scavenging depot on the-north side. A bird’s eye view of the lower end of the valley known as Tower Hamlets and the London Road-Bridge Street area, in the early 1930s. On the right is Tower Hamlets Road and its junction with the main street and Bridge Street. In the foreground Tower Hamlets Road passes over the railway, alongside which is the old Corporation scavenging yard and stables, and joins up with Tower Street and East Street running horizontally across the picture. On the left is Widred Road and the old school with its playground adjoining the road. 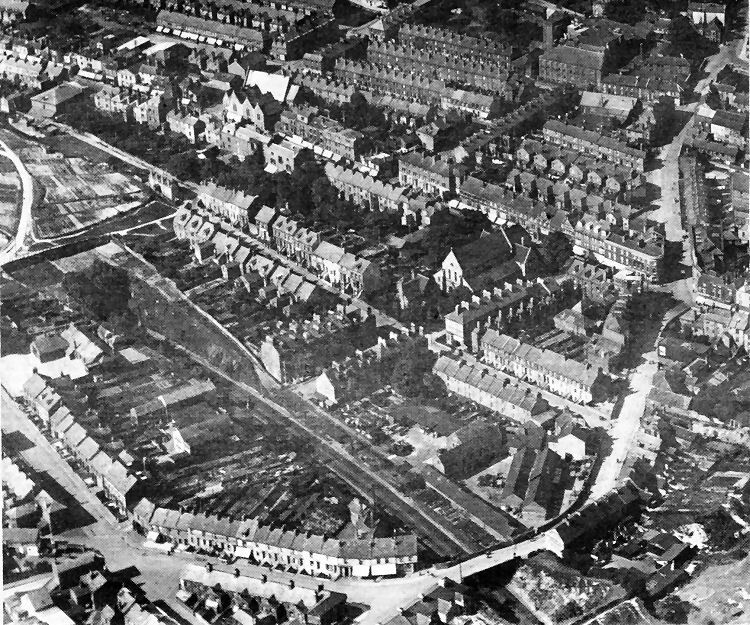 Top right is Charlton Mill and near the centre of the picture are the recently demolished St. Bartholomew’s Church on one side of London Road, with the London Road Methodist Church further up on the other side.